Dean Bakopoulos, author of "Summerlong"
About This Bright River A woman cut off from her promising career returns to her home town, where her past converges with that of a newly released convict. Set in Wisconsin, this new novel from the author of The cradle is rich with dark humor and piercing intelligence. Ben Hanson’s aimless life has bottomed out after a series of bad decisions, but a surprising offer from his father draws him home to Wisconsin. There, he finds his family fractured, still reeling from his cousin’s mysterious death a decade earlier. Lauren Sheehan abandoned her career in medicine after a series of violent events abroad. Now she’s back in the safest place she knows - the same small Wisconsin town where she and Ben grew up - hiding from a world that has only brought her heartache. As Lauren cautiously expands her horizons and Ben tries to unravel the mysteries of his family and himself, their paths intersect. Could each be exactly what the other needs? Patrick Somerville grew up in Green Bay, Wisconsin, went to college at the University of Wisconsin-Madison, and later earned his MFA in creative writing from Cornell University. Author of two story collections and a novel, He currently teaches in the MFA programs for Northwestern and Warren Wilson. His novel, The cradle, was nominated for the Center for Fiction’s First Novel Award, named one of the Ten Best Books of 2009 by Janet Maslin of the New York Times and was also a Barnes and Noble Discover Great New Writers pick. Patrick’s writing has appeared in The New York Times, One Story, Epoch, GQ, Esquire, and Best American Nonrequired Reading. 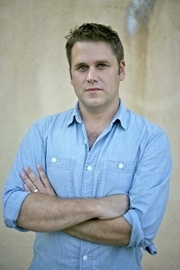 He is a MacDowell Fellow and the 2009 winner of the 21st Century Award, given annually by the Chicago Public Library. Meanwhile, Zeke remains somewhat naïve to the life he’s living and how his daily decisions may be threatening his own chance at true happiness. With the ambitious goal of gaining custody of his orphaned nieces, he uses the advice in a women’s magazine to scope out the possibility of finding the perfect mate (be she Sofia Coppola, a beautiful divorcee or fellow barista) in order to bring together this life he envisions for himself. As with any romanticized future combined with the harsh realities of daily living in today’s world, however, the comic and the fall are often one and the same. About the Dean Bakopoulos Originally from Detroit, Dean received his MFA from the University of Wisconsin-Madison. His first novel, Please Don’t Come Back From the Moon was a New York Times Notable Book. A recipient of both Guggenheim and National Endownment for the Arts fellowships, Dean’s essays and criticism have appeared in The New York Times Book Review, The Los Angeles Times, The Miami Herald, The Progressive, Believer, and Real Simple. The former director of both the Wisconsin Book Festival and the Wisconsin Humanities Council, he is currently a professor in the MFA Program in Creative Writing & Environment at Iowa State University. Dean Bakopoulos is currently considered a "single author." If one or more works are by a distinct, homonymous authors, go ahead and split the author. Dean Bakopoulos is composed of 1 name.